After a long run or race, I love coming home to a hearty and delicious meal. Though I love my post-race burgers and beer, fueling up with nutritious and healthy food helps speed recovery. I focus on lean protein to rebuild the muscles, healthy fats and a mix of good carbohydrates, all without losing any flavor. This is my take on a classic spaghetti and meatball dish with a Greek twist. 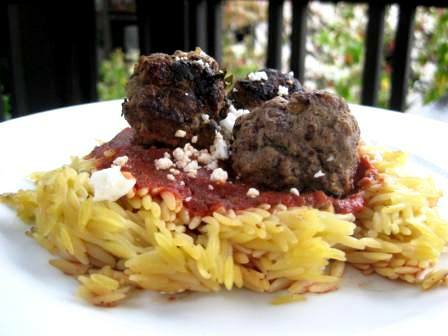 I use orzo which is a rice-shaped pasta, classic tomato sauce and lean ground lamb to make the meatballs. The meatballs are flavorful and juicy and makes the perfect bite with the saltiness of the feta cheese. This could also be good for a pre-race meal as well! The few days after a hard race, I bulk up my meals with protein and veggies. A tempting as gorging on junk food may sound, your body will thank you for a healthy and delicious meal when you feel great the next day. Make sure to hydrate with lots of water and electrolytes. My liquid of choice includes fruit smoothies and lots of coconut water. Some of my other favorite post race meals include: Thai Steak Salad, Chicken & Sun-Dried Tomato Orzo, Citrus Halibut and Teriyaki Tofu with Cremini Mushrooms. Happy recovery! 2. Cook orzo according to package directions; drain. Keep warm. 3. Combine breadcrumbs and next 8 ingredients (through Worcestershire sauce) in a medium bowl; stirring mixture until combined. Shape mixture into 12 (1-inch) meatballs. 4. Heat oil in a large ovenproof skillet over medium-high heat. Add meatballs to pan; cook 8 minutes, turning to brown on all sides. Drain well; wipe pan clean with paper towels. Return meatballs to pan. Spoon marinara sauce over meatballs; sprinkle with cheese. Bake at 375° for 11 minutes or until meatballs are done. Serve over orzo. how did you know that Lamb was our favorite?! YUM!